Next week’s T-Mobile Tuesday goodies have been revealed, and there’s a major focus on pets. 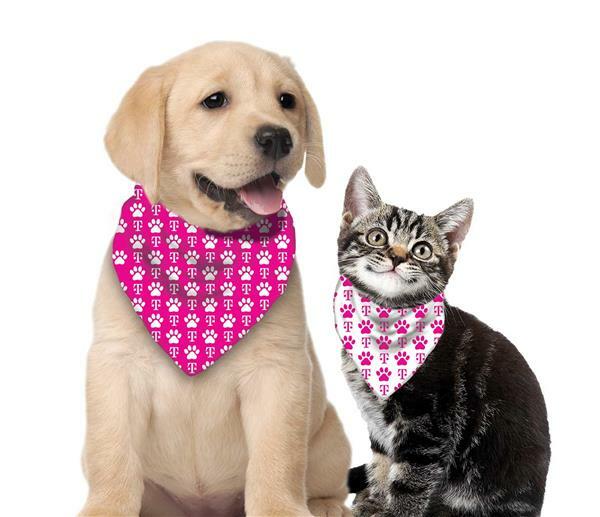 T-Mobile customers can score a free T-Mobile pet bandana next Tuesday, complete with paw prints and the T-Mobile logo. You can pick up your bandana at a T-Mobile store. Also coming to T-Mo customers next week is a $7 discount at PetSmart when you spend $7 or more. Do note, though, that you’ll need to be a member of PetSmart’s PetPerks rewards program to take advantage of this discount. And if you buy a bag of dog food or cat food, PetSmart will give a meal to a pet in need. Rounding out next week’s free gifts is $25 to spend at Restaurants.com and a free movie rental or purchase (up to $5.50) from Vudu. Next week’s grand prize winner will receive $2,000 in PetSmart gift cards as well as a check for $857 to spend on taxes or other expenses. Twenty-five first prize winners will each get a $200 PetSmart gift card, and 200 second prize winners will each receive a $50 PetSmart gift card. I only cash it in when there’s a movie rental or perhaps a cheap cinema ticket. Nothing else has been of interest to me. And the minimum is usually $25. The hell i want $50 worth of takeout food for? Looking forward to next Tuesday! I will for sure get my cat a banana and petsmart is very close to the T-Mobile store as well so I can get her some food or something as well. Plus a free movie rental hell yes! The only promotion I really had interest in was the DD certificates. I agree stick to food/drink items that do not require additional cash outlay. I missed their promotion for an extra line for free. I wish they’d run that one again even if for one day. How many promotions can we claim each week? Free is Free, so I can’t complain even though I don’t see anything interesting this week.